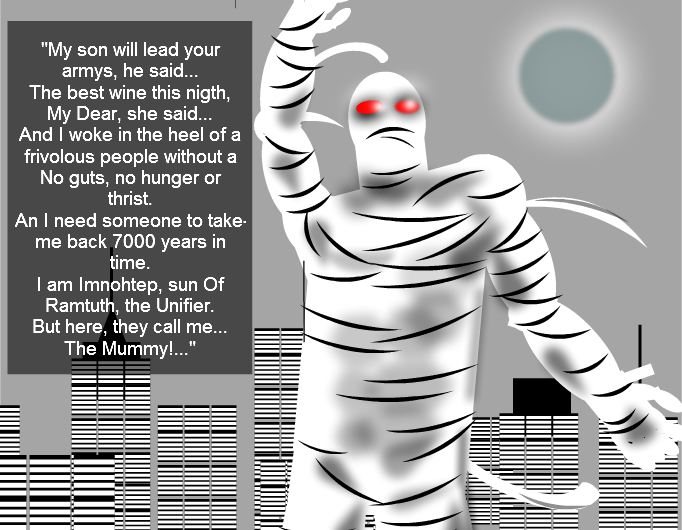 Stripgenerator.com - "Mummy...They call me The Mummy!..." "Mummy...They call me The Mummy!..." This strip is a reply to Inter-dimensional Rider, Scared eyes, Behind you !, Where ever I(sis) lay my hat (head), Egyptology (Cow and Co. 66), Mummy, Tarzan, the shakespeare feather pen, Imnohtep - the Mummy and the time machine. And I woke in the heel of a frivolous people without a No guts, no hunger or thrist. An I need someone to take-me back 7000 years in time. I am Imnohtep, sun Of Ramtuth, the Unifier. But here, they call me... The Mummy!..." Great picture, it reminds me of the Mummy from one of them Goosebumps books! Thumb's up! Mummy, mummy? You look like daddy! This was my reference, dear JR - the great - and ugly Boris karloff! Thanks! I walk up to somebody. I was born one thousand nine hundred and fity-nine years ago. My daddy was a mummy, too. Watch what happens when I walk up to somebody. a lighter and some hairspray and that dude is toast!